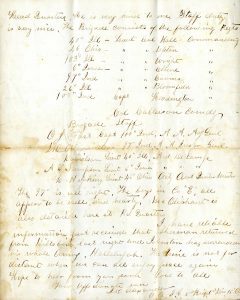 In a Sincerely, Yours post from July 2016, we introduced you to John D. Alexander, an IU alum who rose through the ranks of the 97th Regiment of Indiana Volunteers to ultimately become Acting Assistant Inspector General of the Second Brigade of the Union Army. 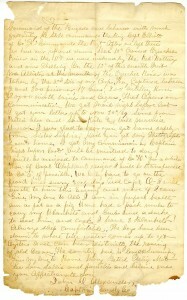 His collection was donated to the Archives in 2015 and contains dramatic letters written to his parents as he marched with Sherman’s army to the sea. In a letter from Camp Anderson, Georgia on December 18, 1864, he writes, “My Dear Parents, I am still alive, for which, I can thank the Good Lord.” Not only did Alexander survive the Civil War, he lived long enough to become the oldest living graduate of Indiana University from 1929 until his death on February 27, 1931. Since the collection was first opened to researchers last spring, the collection has been popular with faculty and students for use in history and folklore classes. The collection provides a great local context to a larger national event, the Civil War. 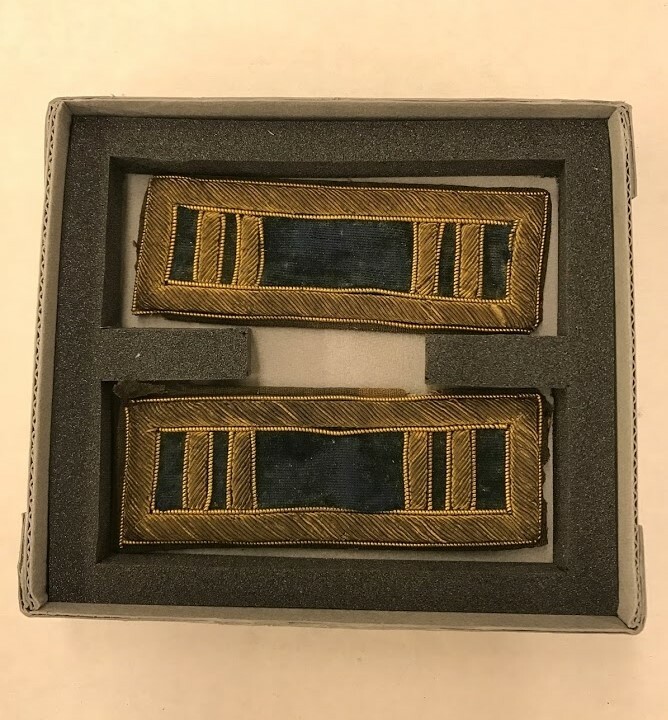 With the rich research value of the collection, you can only imagine how excited we were to learn that the Archives would be acquiring additional materials to add to the collection. 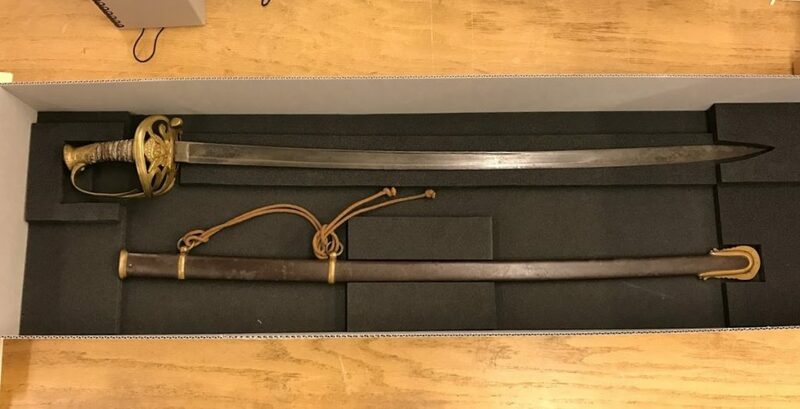 Because Alexander and his wife did not have any children to pass along their belongings to, their materials were separated among close family friends and more distant relatives. 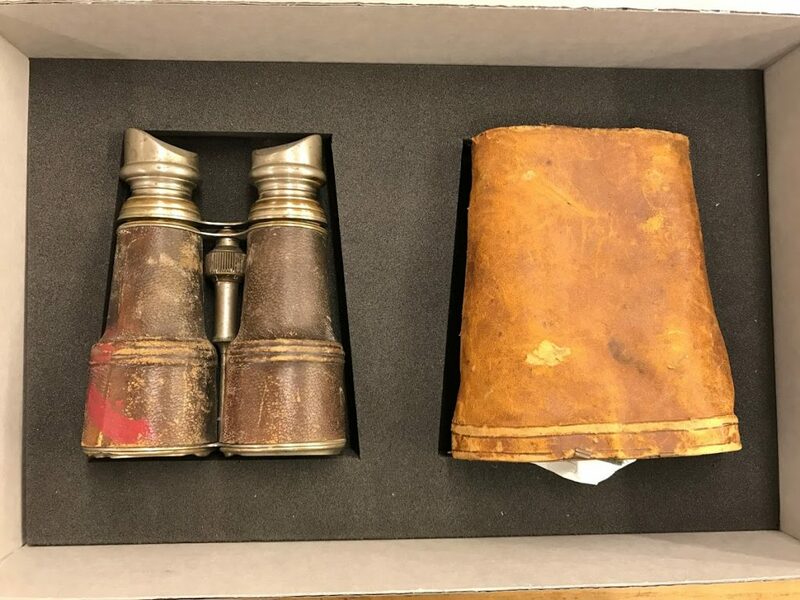 In April 2017, the Archives learned that we would be receiving a scrapbook, a pair of Chevalier Paris binoculars, Alexander’s Union Army Captain shoulder strap insignia, and his Captain’s sword. 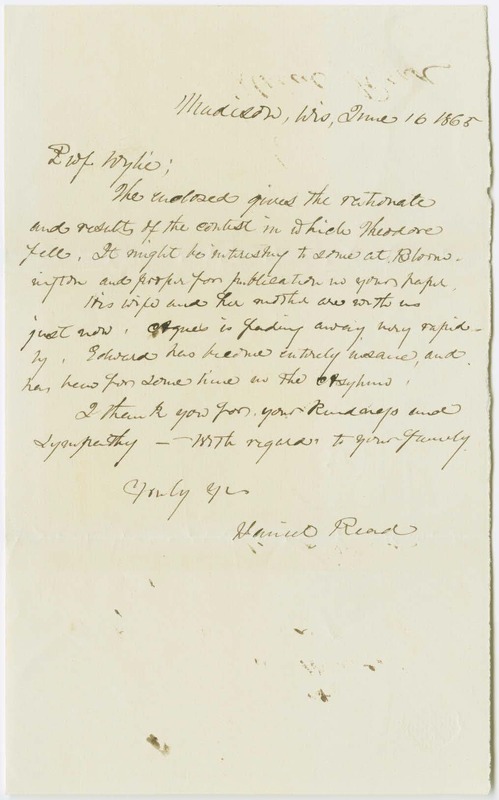 These new additions provide researchers with a deeper connection to the man behind the Civil War letters. In his post-Civil War life, Alexander served as a prosecuting attorney in Greene, Owen, and Morgan counties in Indiana and was the representative of Greene County in the Indiana General Assembly of 1887. He was also highly active in the Grand Army of the Republic, an organization composed of Union Army veterans, and attended nationally encampments in San Francisco, Minneapolis, Des Moines, Chicago, Indianapolis, Louisville, Chattanooga, Toledo, Columbus, Boston, Buffalo, and Atlantic City. He served as State Commander of the Indiana G. A. R. from May 1908 to May 1909. Alexander’s interest in the G.A.R. and veterans’ issues are reflected in the scrapbook he filled with newspaper clippings about Civil War monuments, G.A.R. encampments, patriotism, and Indiana G.A.R. activities starting in 1907 until the late 1920s. Papers found tucked within the scrapbook also offer a distinct look into Alexander’s life. These pages include correspondence to distant relatives who named their son “John Alexander,” a page from a family Bible detailing birth and death dates, and even Alexander’s personal research regarding George Washington’s potential affairs. We’ve enjoyed learning more about one of IU’s most distinctive alumni and hope that you will consider a visit to the Archives to see these new additions. The collection is partially digitized and can be viewed here. Please contact the IU Archives if you would like to learn more about the life of John D. Alexander. Andrea has since graduated and moved on, but she left us with some of her amazing blog posts ready to go! Congratulations to Andrea and we think we convinced her that archives is where she wants to be! 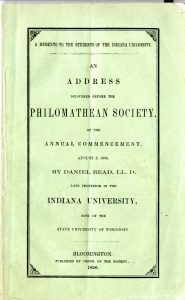 You may recall this post by Katie Martin from summer of last year about John D. Alexander, an 1861 alumnus of IU and later Union Captain during the Civil War. 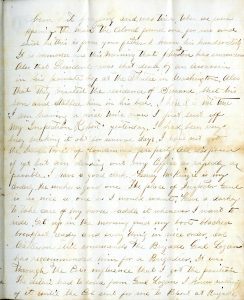 Over the past week or so, I’ve been transcribing all of the Civil War letters in Alexander’s collection, including the one that Katie included in her post. It’s been a real treat to read these as the letters definitely provide some unique insight into war strategies, the day-to-day life and sentiments of soldiers, and the means of communication during the mid-19th century. As an American History major, the Civil War has been a topic of particular interest to me for some time. So getting to read a primary source not already heavily picked over by historians is exciting, to say the least. You can read some of Alexander’s biographical information in Katie’s post. By the end of the war, he was serving as an Acting Assistant Inspector General of the Second Brigade under William Tecumseh Sherman’s army. His brigade marched into Raleigh, North Carolina in April of 1865. On April 9th, 1865, General Robert E. Lee surrendered to Ulysses S. Grant in Virginia, a significant marker that indicated the war was almost over. 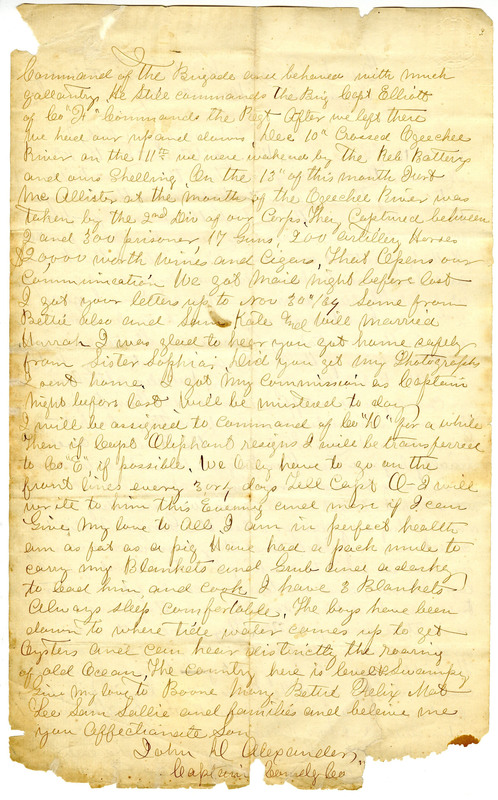 By the time John Alexander was writing a letter to his parents on April 18th, Sherman had been in Raleigh having an ongoing negotiation with General Joseph Johnston about the terms of another Confederate surrender. Johnston’s surrender turned out to be the largest surrender of men during the entire war with 89,270 soldiers in all. I have reliable information just received that Sherman returned from Hillsboro last night and Johnston has surrendered his whole Army. Hallelujah. The time is not far distant when we can all enjoy peace again. I personally learned a lot from this letter alone about the ambiguity in those few days when no one was quite sure of whether or not the war was really over. The Union soldiers weren’t entirely sure how they should treat the members of the opposing army. For the most part, it seemed like they were just happy that the fighting was over and had no desire to perpetuate any more violence. Union soldiers even offered the Confederate deserters and discharged members of Lee’s army their food and shelter (which they may have had very little of in the first place). Alexander doesn’t mention any instances of contempt or violence on either of their parts, other than his own hesitation to offer forgiveness after all the damage that had been done by the Confederates. When Lee surrendered his army, the terms of surrender were considered, by some, to be overly lenient. Soldiers and officers only had to turn over their weapons, but were given leave to return home immediately– thus the surplus of discharged Confederate soldiers that Alexander saw passing by or through their camp. Alexander was clearly among those who thought that Lee’s army should have been more severely punished for their rebellion. Johnston’s surrender was supposed to be even more merciful than Lee’s. By the time the second half of Alexander’s letter was written (April 19th) Sherman and Johnston had agreed upon the terms that would reinstate Confederate state governments. However, officials in Washington D.C. wholly rejected these terms, outraged by Lincoln’s assassination, and a few days later, the original terms were dissolved and changed to terms identical to that of Lee’s. 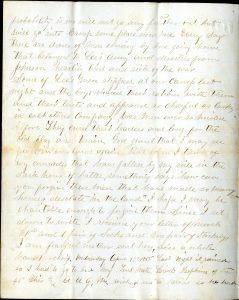 Check out the John D. Alexander collection in the Archives Online to see digitized versions of all of the letters. One fine morning a Red flag with One White Star was flying from the highest point of the University Building. The whole town was thrown into a frenzy of excitement. Students and people of the town soon filled the Campus – the flag was torn down and dragged through the street to Doctor Nutt’s residence – then to the Court House Square where speeches were made denouncing the ones who put the flag there and particularly South Carolina and the flag was burned. 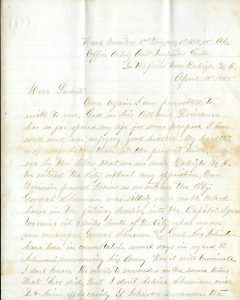 Alexander taught school for a year and then enlisted as a private in Company E, 97th Regiment of Indiana Volunteers in August 1862. On June 27, 1864, Alexander was wounded in his right hip at the Battle of Kennesaw Mountain in Georgia. He quickly recovered, however, and returned to his company in October 1864. Alexander and the rest of the 97th Regiment marched in Sherman’s army from Atlanta to Savannah, from November 15 until December 21, 1864. 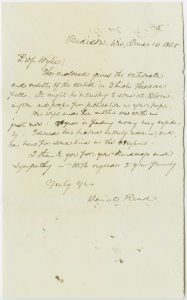 The following letter is written by Alexander to his parents. 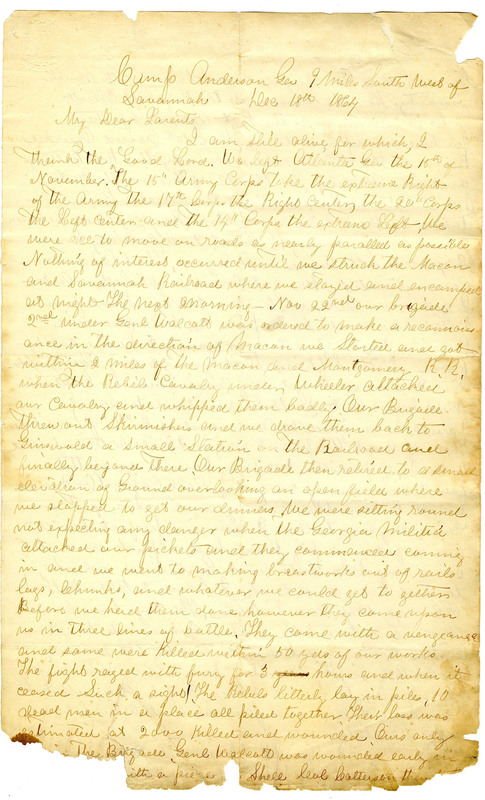 He describes his experience in the Battle of Grindswoldville in Georgia, the first battle of Sherman’s March to the Sea, as well as movements of the regiment and news of his promotion to Captain of Company D. Just a note that within the letter, Alexander invokes some language of the time that would be offensive if employed today. See full transcription below the images. I am still alive for which I thank the Good Lord. We left Atlanta, Geo. the 15th of November. The 15th Army Corps take the extreme Right of the Army. The 17th Corps the Right Center, the 20th Corps the Left Center and the 14th Corps the extreme Left. We were all to move on roads as nearly parallel as possible. Nothing of interest occurred until we struck the Macon and Savannah Railroad where we all stayed and encamped at night. The next morning – Nov 22nd our brigade 2nd under Gen Walcott was ordered to make a reconnaissance. Once in the direction of Macon we started and got within 2 miles of the Macon and Montgomery R.R. when the Rebels Cavalry under Wheeler attacked our Cavalry and whipped them badly. Our brigade threw out Skirmishes and we drove them back to Grindswold a small Station on the Railroad and finally beyond there. Our brigade then retired to a small elevation of ground overlooking an open field where we stopped to get our drummers. We were sitting round not expecting any danger when the Georgia Militia attacked our pickets and they commenced coming in and we went to making breastworks out of rails, bags, chunks, whatever we could get together. Before we had them done however, they came upon us in three lines of battle. They came with a vengeance and some were killed within 50 yds of our works. The fight raged with fury for three hours and when it ceased Such a sight! The Rebels literally lay in piles, 10 men in a place all killed together. Their loss was estimated at 2,000 killed and wounded. Ours only… [section of letter missing] The Brigade Genl Walcott was wounded early on…[section of letter missing] with a piece… [section of letter missing] Shall look… [section of letter missing] Command of the Brigade and behaved with much gallantry. He still commands the Brig. Capt. Elliott of Co “H” commands the Regt. After we left there we had our ups and downs. Dec. 10” Crossed Ogeechee River on the 11th we were wakened by the Reb Battery and our Shelling. On the 13“ of this month Fort McAllister at the mouth of the Ogeechee River was taken by the 2nd Div of our Corps. They captured between 2 and 300 prisoners, 17 guns, 200 artillery Horses, $2,000 worth of wines and cigars. That Opens our Communication we got mail night before last and I got your letters up to Nov 30″/64. Some from Bettie also and Sam Kate and Will married Hannah. I was glad to hear you got home safely from Sister Sophia’s. Did you get my photographs I sent home? I got my Commission to Captain night before last. Will be mustered today. I will be assigned to command Co “D” for a while. Then if Captain Oliphant resigns I will be transferred to Co “E” if possible. We only have to go on the front lines every 3 or 4 days. Tell Captain O – I will write to him this evening and more if I can. Give my love to All. I am in perfect health am as fat as a pig. Have had a pack mule to carry my Blankets and Grub and a darky to lead him and cook. I have 3 blankets Always sleep comfortable. The boys have been down to where the water comes up to get oysters and can hear distinctly the roaring of old Ocean. The country here is level and swampy. Give my love to Boone, Mary, Bettie, Felix, Mat, Lee, Sam, Sallie, and families and believe me you. In April 1865, Alexander was appointed Acting Assistant Inspector General of the Second Brigade by General John A. Logan in Goldsboro, North Carolina. He was mustered out of service on June 9, 1865 following the Grand Review of the Armies, a victory procession through Washington, D.C. 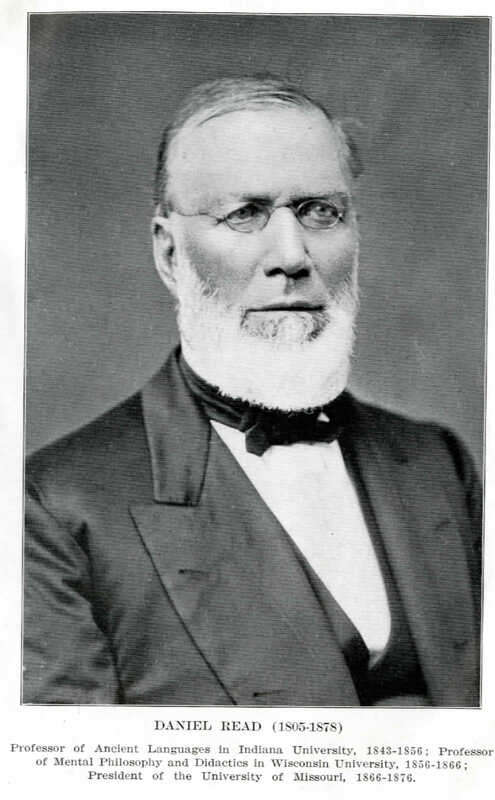 Following the Civil War, Alexander served as a lawyer in Bedford and Bloomfield. He went on to hold several elected positions in state and county government. Alexander was also regular attendant to all national and state encampments of the G.A.R. His involvement in the G.A.R. led him to write a History of the Ninety-seventh Regiment of Indiana Volunteer Infantry in 1891. In 1929, Alexander was the oldest living graduate of Indiana University. He died on February 27, 1931. The above letter, along with 11 others, can be found in C23 John D. Alexander Family Papers. 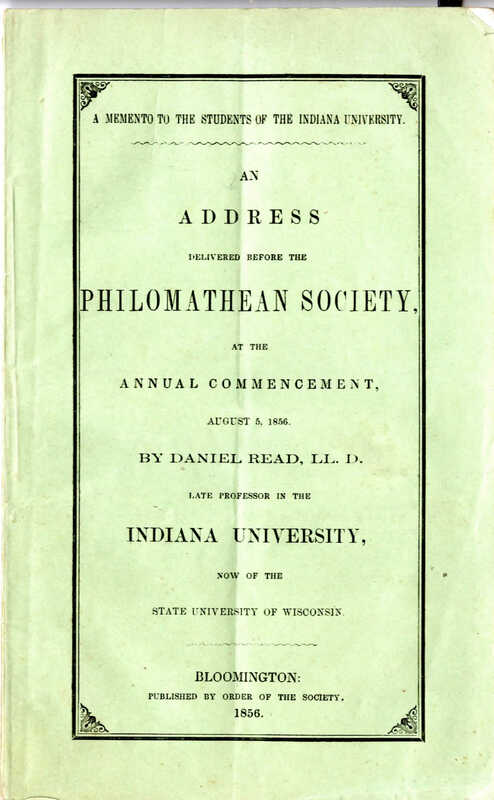 To learn more about Indiana University and the Civil War, contact the IU Archives.